Peter is a relatively new Magic artist with his first art appearing in 2011. His first card is a mythic rare from the Commander 2011 set. Which one? Animar, Soul of Elements of course. Following Commander 2011, Peter's art showed up on a single card in M12 (an Island) and several more cards in Innistrad such as Grimgrin, Corpse-Born and Gavony Township. In addition to several more cards in the Innistrad Block, his first planeswalker turned out to be Tibalt, the Fiend-Blooded. There are a two cards printed in M13 (Knight of Glory and Knight of Infamy) and several cards in the Return to Ravnica Block with art by Peter. For a list of all cards with art by Peter Mohrbacher, click here. For the wallpaper for Peter, I decided to go with one not found on any cards and was created to depict an image from the Theros novel Godsend. If you're a regular reader, you know the drill: click the image to go to the download page for the wallpaper. 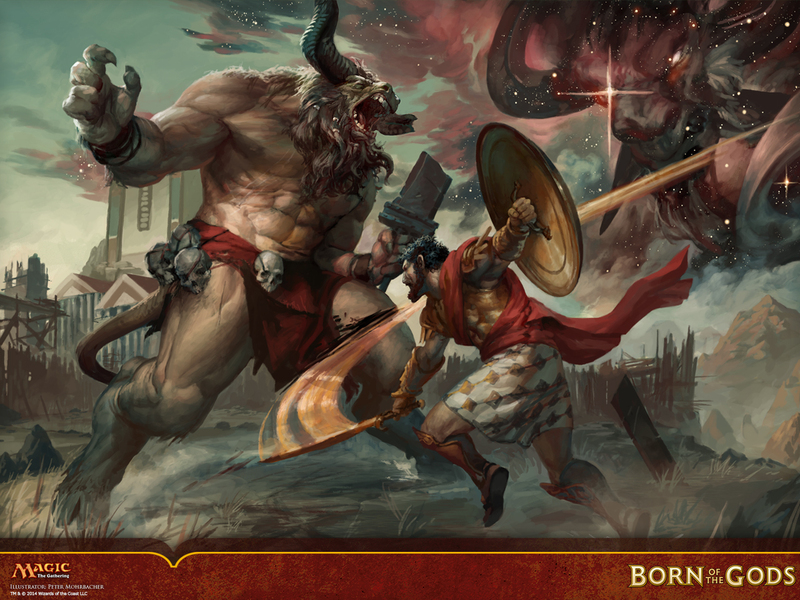 Also as a special treat (and due to the large number of wallpapers Wizard's has of Peter's art), some of the above card images are clickable and will take you to wallpaper for their card art. Have fun! You can find Peter on his Website, Facebook, and Twitter. You can find more of Monday Morning MTG on Twitter and now Facebook.